The red ring surrounding the blue dot near the centre of the image was provided by the MUSE integral field spectrograph instrument on the Very Large Telescope. This latter feature was key to the neutron star hunt. The ring is due to emission from neon and oxygen ions, and it perfectly circled what was previously an uninteresting X-ray source. However, now that this X-ray source had a target painted around it, Vogt et al. 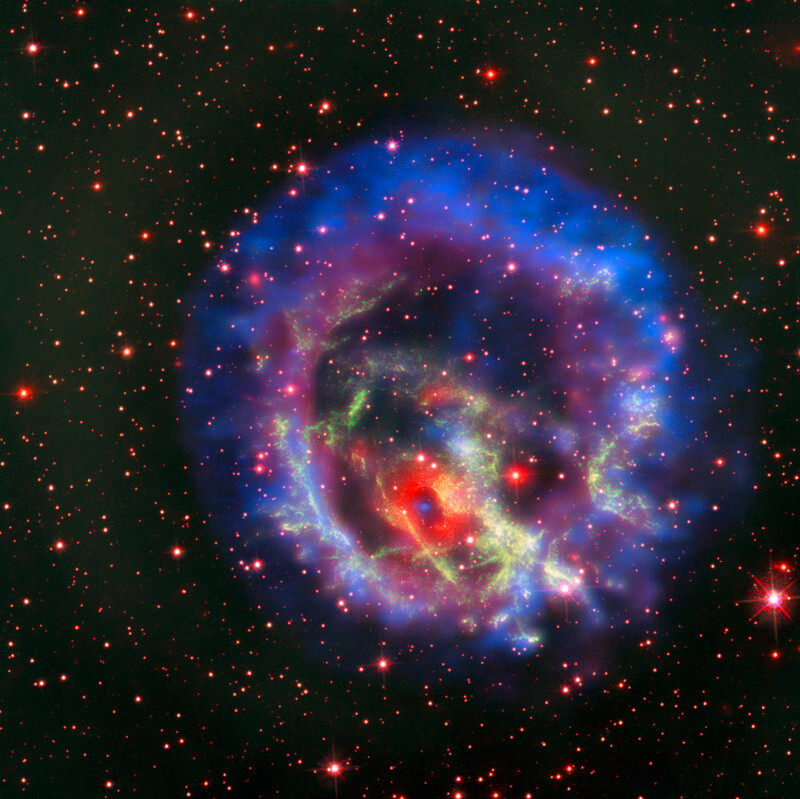 realised that it must be the high-density remnant from the supernova explosion, an isolated neutron star. Such objects are typically very hard to find, because they only shine at X-ray wavelengths. Indeed, this was the first (non-pulsar) neutron star to be found outside our Galaxy — they should be common. This supernova remnant, 1E 0102.2-7219, now joins the ranks of the well-known Galactic supernova remnants, Cassiopeia A and Puppis A, as remnants with an identified Central Compact Object.